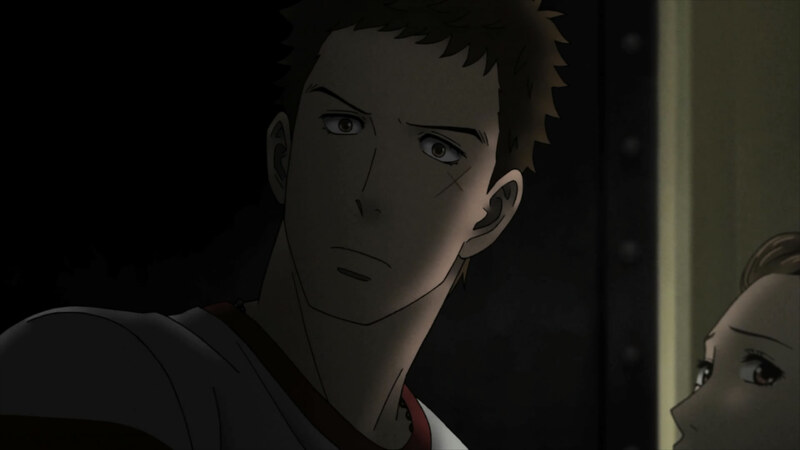 I’ve made the complaint before that Sakamichi too often advanced the plot at the expense of the music. It seemed previously incapable of balancing the context of the story with the story itself, and that was one of its biggest shortcomings. It seems as if every element in the show thus far has been building up to this single moment. The way that the episode handled this collision of music and plot was absolutely beautiful. This was exactly what I was waiting for, this was everything the show could have and should have been since the beginning, and the fact that we waited through 6 intricate episodes for these intimate, pent-up emotions to accumulate makes it all the sweeter. 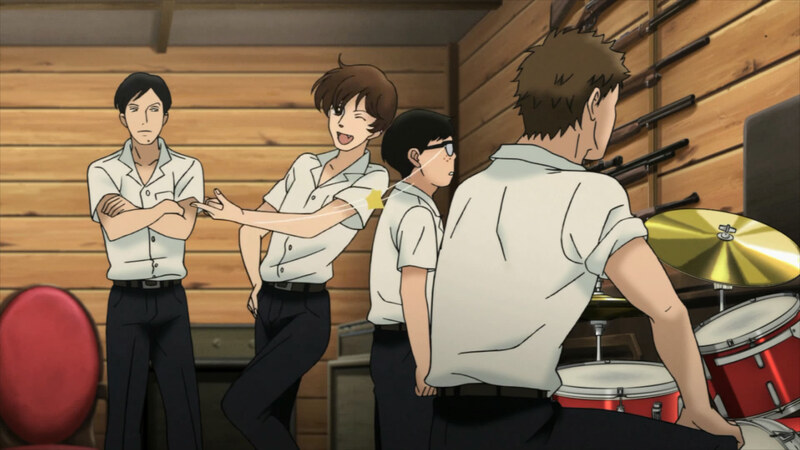 This sequence sees the advancement of two of the show’s most pressing character relationships, namely those between Kaoru and Ritsuko, and the former and Sentarou. What made the sequence the most beautiful was how unspoken all of it was. The show did not have to explain to the viewers “Kaoru and Sentarou have made up now” because the music made it obvious. It didn’t have to write out that Kaoru, despite everything, still loves Ritsuko because he transcribed and practiced “My Favorite Things” for her sake. The ultimate goal of a music-based show, I think, is to have the music become the vehicle for the plot, instead of a result of it; it should be the fuel of the story, not the exhaust, if you will, and, with this episode, it has at last come to fruition. But none of this would mean very much if the music wasn’t very good, but, luckily, that’s not something we have to worry about. Jazz is music that is carefully, painstakingly prepared for hours and hours ahead of time that happens utterly spontaneously, “the sound of surprise.” This is the reason why they say jazz, to be truly appreciated, absolutely must be heard live, because a recording of jazz is only a snapshot of that surprise. A jazz tune is a story – watching it unfold in front of you is half the fun – but it’s not the kind of tale you just write down because listening to great jazz performers play a song is a truly special experience. That song will never be played that exact same way ever again, and it was never supposed to. You experienced something that will only ever happen in that particular way once in the history of the universe. Listening to a recording of that is sort of a betrayal of what jazz is at its heart. I think this episode captured this magical little something better than any other representation of a live jazz performance in any sort of media, ever. This, along with everything that occurred plot-wise before it, made the episode, hands-down, the best installment so far. 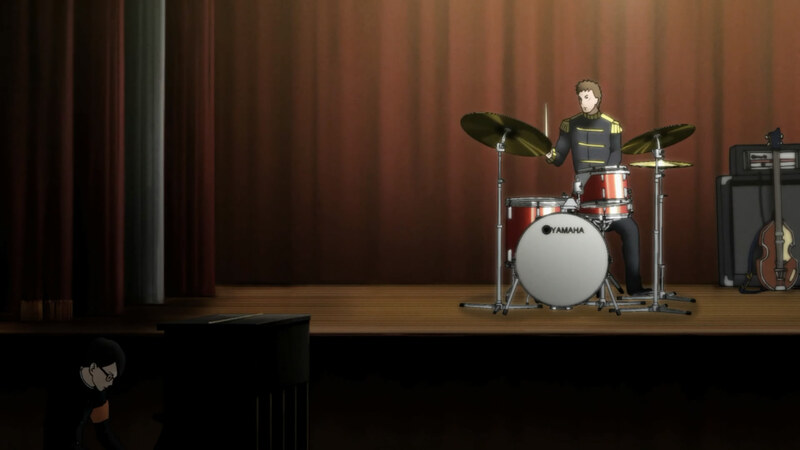 Still, I must point out a small-ish blemish: there is a clearly audible tambourine in the right channel in the rock band’s performance when there is no such instrument being played. This would easily pass for a goof in any other show, but in a program that has prided itself in portraying that 1:1 ratio between what’s on screen and what’s being played, it stuck out to me as poor quality control, especially when the piano/drum duet was so well done later on. Actually, I was playing the tambourine to the band off screen, a little to bottom right of the screen at 13:29. Of course! We should never discount audience participation in a musical act, which makes it all the more fun!